hgtv – Design Your Lifestyle. When you think of the finest media outlets for home design, HGTV is as good as it gets. That’s why it’s such an honor that Peter Salerno is recognized as an HGTV Professional. 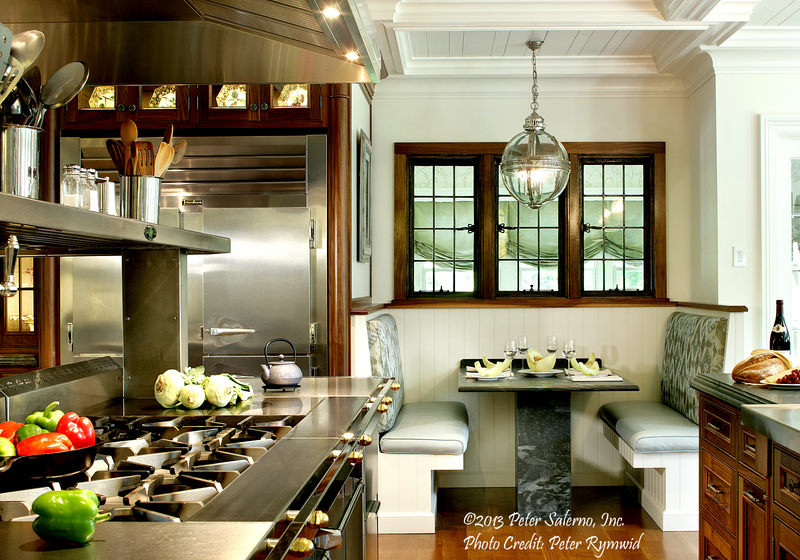 On Peter Salerno’s official HGTV Professional page, you’ll get a quick biography of Peter and his award-winning kitchen and bath design company, as well as an in-depth portfolio of some of Peter’s favorite recent projects. 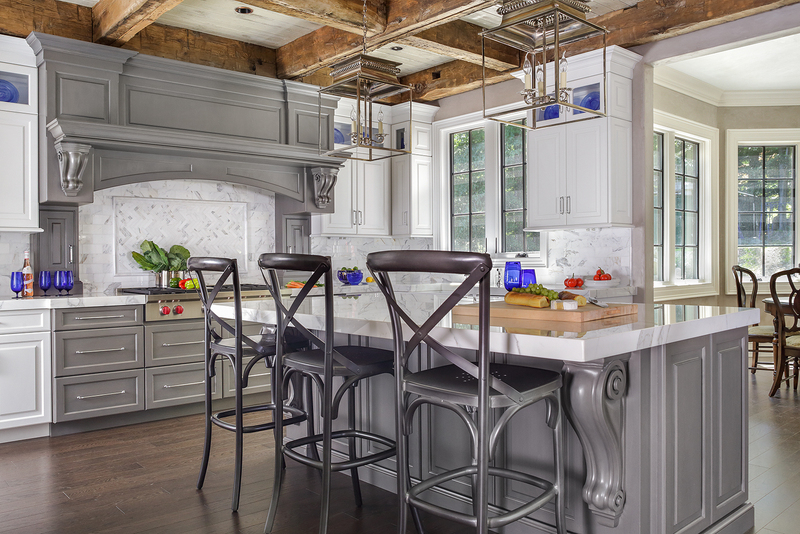 Take a moment to browse Peter’s HGTV design gallery, including views of his award-winning kitchen designs, bath designs, custom cabinetry, reclaimed tin range hoods, and the perfect marriage of beauty and function. 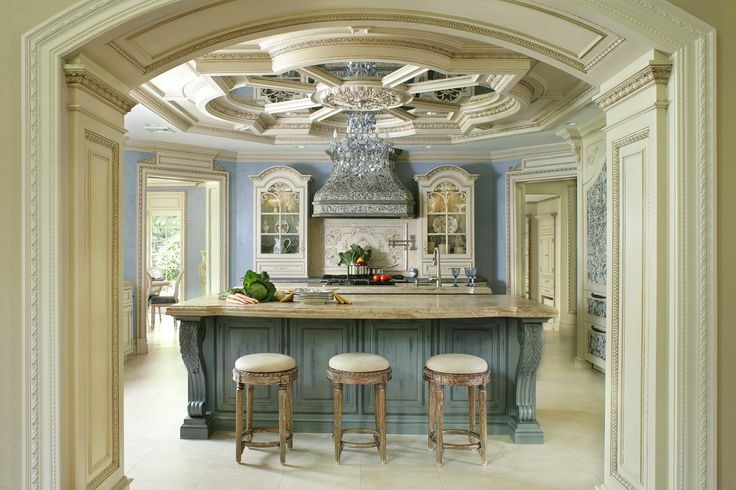 If you love Peter Salerno’s designs, and want his craftsmanship and elegant designs in your home, residence or office, fill out the contact form below and a member of the Peter Salerno Inc. team will respond as soon as possible. July 2017 July 2017 Peter Salerno, Inc. 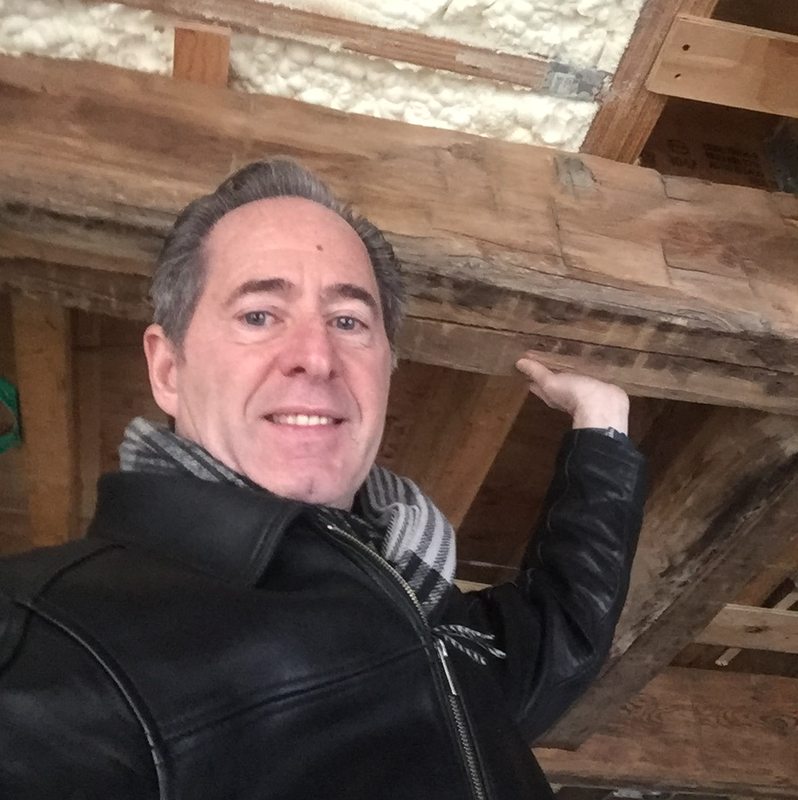 Since Peter Salerno, the owner of our parent company, is an HGTV Featured Designer, we at Design Your Lifestyle always turn to HGTV and its staff for the latest in tips, trends and design ideas. HGTV has been particularly on point in 2017, with great articles about Summer 2017 home design trends and “runway-to-home” design transitions. But one of their latest articles, regarding the hottest prints, patterns and textures in home design for 2017, might be our favorite of the recent bunch. “Make a Statement: Print, Pattern and Finishes Trends” by HGTV’s Felicia Feaster may as well be your 2017 Design Primer when it comes to home creation and renovation. In the article, Felicia guides you through the “trendsetting fabrics, wallcoverings, patterns and finishes that define great style in 2017”. Here are a few of our favorite selections from the article. Read them through, and then head over to HGTV to read the full article and see all the trends! 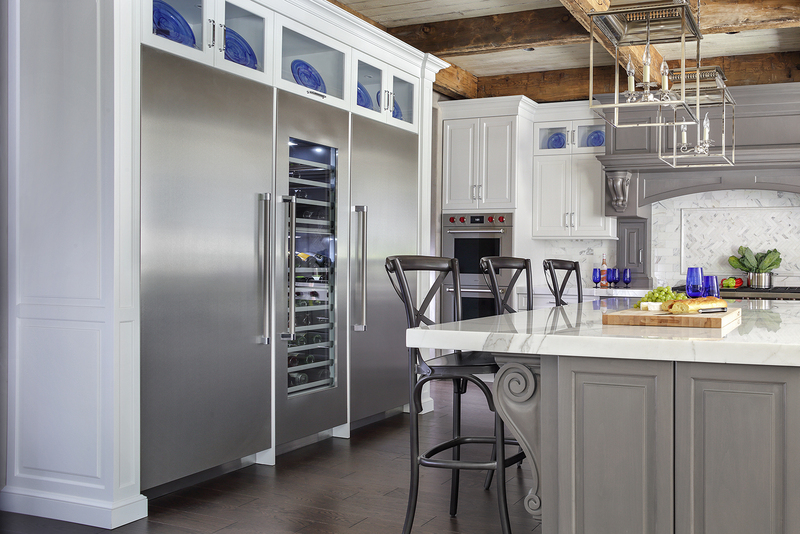 Transitional design is all the rage (especially in transitional kitchens). In this case, Felicia Feaster is referring to mixed media and materials when it comes to major design elements like flooring. “[A] thoughtful mix of wood and other surfaces to create flooring juxtapositions,” explains Felicia. This also pertains to surprising materials or “faux” materials, like in the Peter Salerno Inc. transitional kitchen design below. The “wood grain flooring” you see is actually durable porcelain wood tile. Coupling the gorgeous aesthetic of dark, weathered wood with the durability of porcelain tile ensures that the floor will look great AND hold strong. It’s the perfect way to get that transitional kitchen flooring “feel” while making sure it can withstand the toll of kids, guests and the family dog. Wall prints, designs and frescoes are a great way to transport the mind and body while remaining in the comfort of your home. In the Peter Salerno Inc. bathroom design below, a gorgeous painted wall features the countryside and seaside of Italy, allowing the occupant’s imagination to soar and wander. 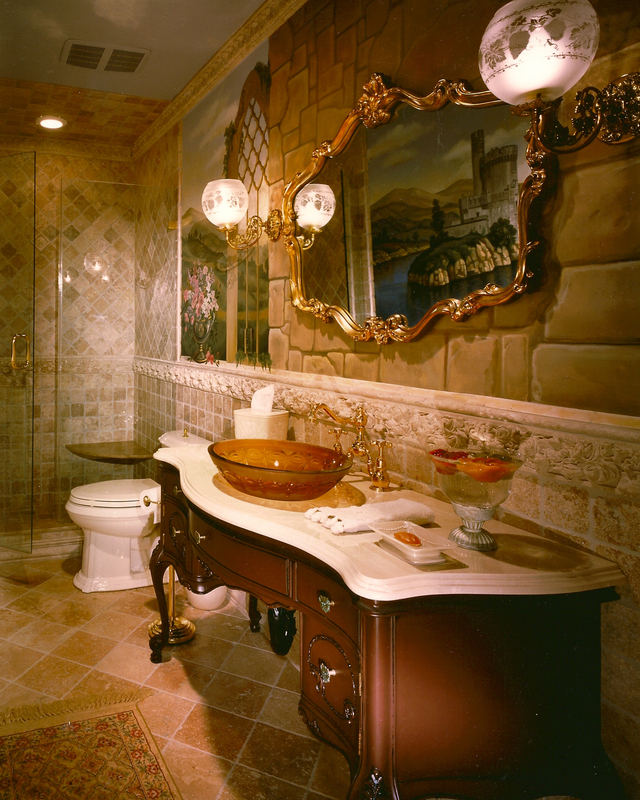 This Peter Salerno Inc. bathroom design features a scenic wall fresco. 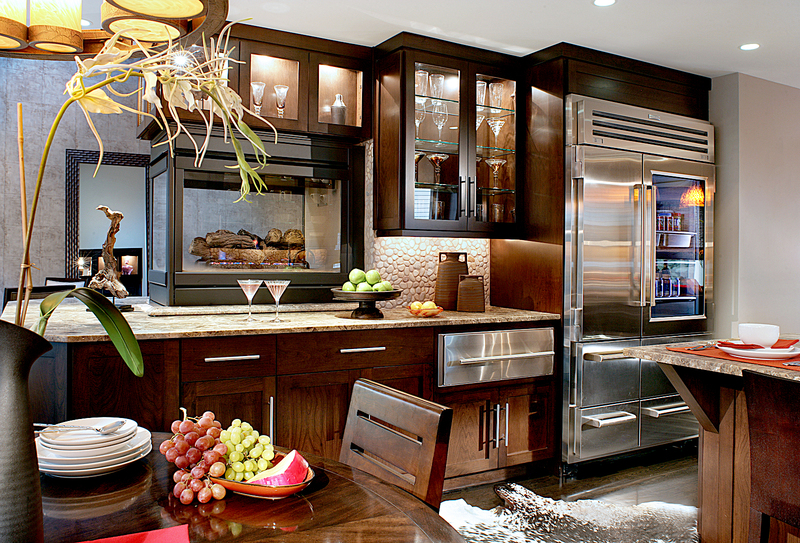 Metallic tones aren’t just for small fixtures anymore. Copper, silver, platinum and gold are everywhere, making standout appearances against neutral, white and black design elements. Be bold in your approach to metallic and mineral tones (more on that in the full HGTV article). Much like whites and neutrals, they’re not just complementary to your design strategy in 2017 – they can be the feature! June 2017 June 2017 Peter Salerno, Inc.
Our friends at HGTV are at it again, staying on the pulse of hot design trends for the summer of 2017. This time, it’s the fabulous Allie Holcomb King (a contributing writer for HGTV.com), with a great slideshow-based piece on the top home design trends for summer 2017. We love this article for two reasons – one, it’s full of gorgeous design photos and helpful suggestions; and two, it makes us look really smart! Of course, when your parent company is Peter Salerno Inc. – the most award-winning custom kitchen and bath design firm of the 21st century – it’s not hard to look intelligent. Allie and the staff at HGTV.com pointed out some trends we’ve been covering here since the spring. Below are 4 of the 14 home design trends noted in HGTV’s article for Summer 2017. Check them out, and see what catches your eye! For the rest of Allie Holcomb King’s summer 2017 design tips, head over to the full article at HGTV.com and enjoy! “An all-white color palette is crisp, clean and refreshing,” says Allie Holcomb King. The main design theme of 2017 continues into summer, with white color design dominating the landscape. The versatility and freshness of whites (and bright neutrals) work brilliantly throughout the home and transition naturally from season to season. A developing theme among top kitchen and living space designers is designing around white walls with tertiary colors, especially in furniture. 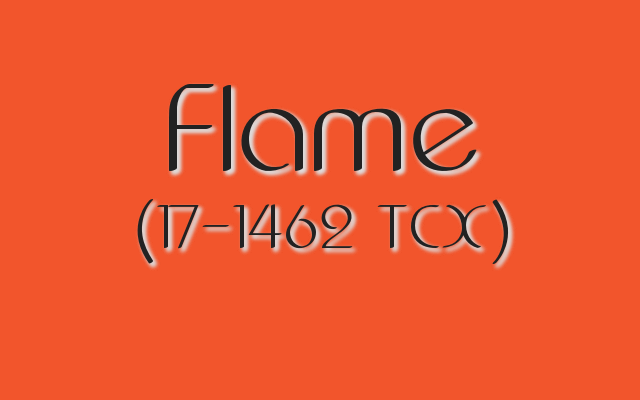 A “tertiary color” is the result of mixing a primary color with its adjacent secondary color on the color wheel. The six tertiary colors are yellow-green, blue-green, blue-violet, red-violet, red-orange, and yellow-orange. This palette brings in some natural jewel tones, which pair well with brass and metallic accents and accessories. “Summer brings with it bold flavors, sights and sounds. This year, we’re noticing bold color is along for the ride too,” says Allie. 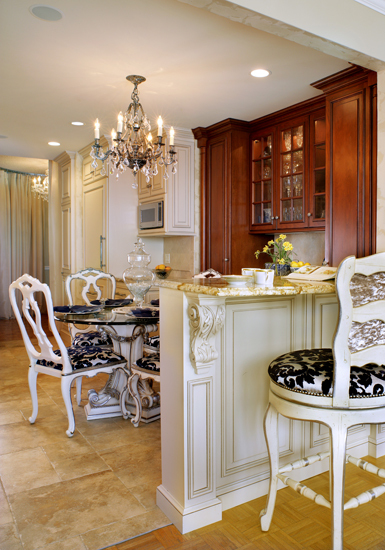 Again, this trend rides the over-arching theme of neutral and white in your primary home design. Instead of splashing color all over your space, try using small pops of bold color around the room for an eye-catching effect. Brass elements in your decor are back in for the summer of 2017 – but unlike many trends, we believe brass fixtures are relatively timeless. Whether you use brass in your door handles, appliance knobs and handles, or statement accessories, brass is an engaging, warm metallic presence in your home design. Our favorite places to utilize brass are in kitchen and bath design, where we’ve watched Peter Salerno and his team use them to dramatic effect. April 2017 April 2017 Peter Salerno, Inc.
One of our go-to articles for Spring 2017 lifestyle and design is courtesy of HGTV’s Chelsey Bowen. Her piece, “Must-See Spring Color Trends”, is a practical-yet-stunning guide to freshening up the colors that define your home design. The moment Pantone revealed its Spring 2017 official color palette, it was clear we were in for a bright, natural and vibrant year in color design. From natural tones like Greenery, Kale and Hazelnut to eye-popping tones like Pink Yarrow and Flame, Pantone made it clear that spring most certainly “sprung” in 2017 design trends. What we love about Chelsey Bowen’s HGTV article regarding spring color trends is that every one of her tips is applicable to a real living space. All too often, fashion and home designers create motifs and designs that just don’t have much real-world application. Chelsey takes great care to ensure that all her Spring 2017 color and design tips can (and will) work in virtually any home of any size and budget. These 8 HGTV tips for smart spring home design range from powerful blocks of color to intelligent use of neutral tones, and from luxurious and opulent to sleek and simple. Here are just a few of our favorite trends spotted by Chelsey Bowen and the team at HGTV. For the full list (and photo gallery), head over to the full article on HGTV’s website. “Liven up traditional design with the hottest spring colors,” Chelsey Bowen suggests, and we couldn’t agree more. 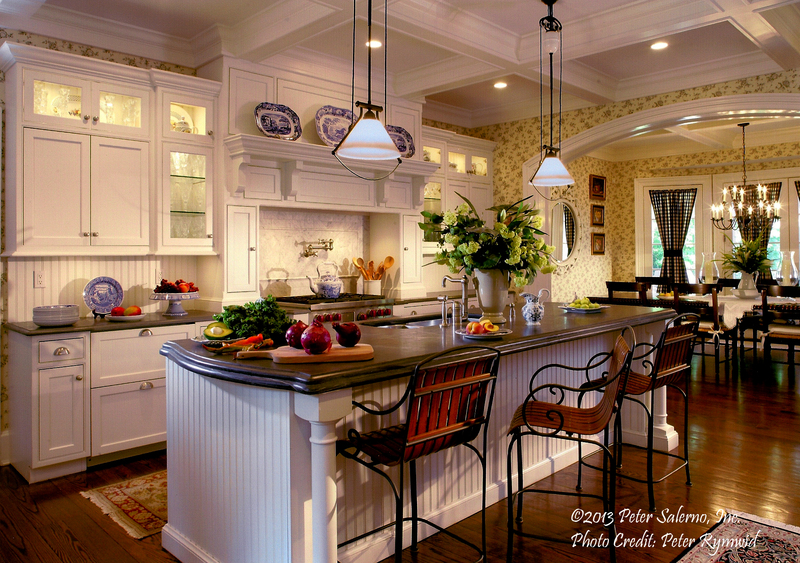 Traditional kitchen design (like the one pictured from Peter Salerno Inc.’s Tesoro collection) never goes out of style – in fact, a traditional design is a smart choice for long-term home owners. 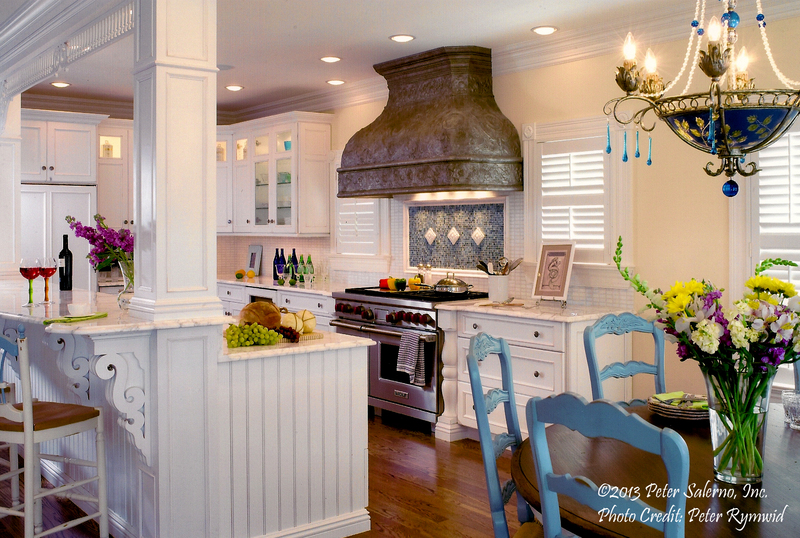 To give that traditional kitchen a new “pop” for spring, try utilizing the “it colors” of the season. 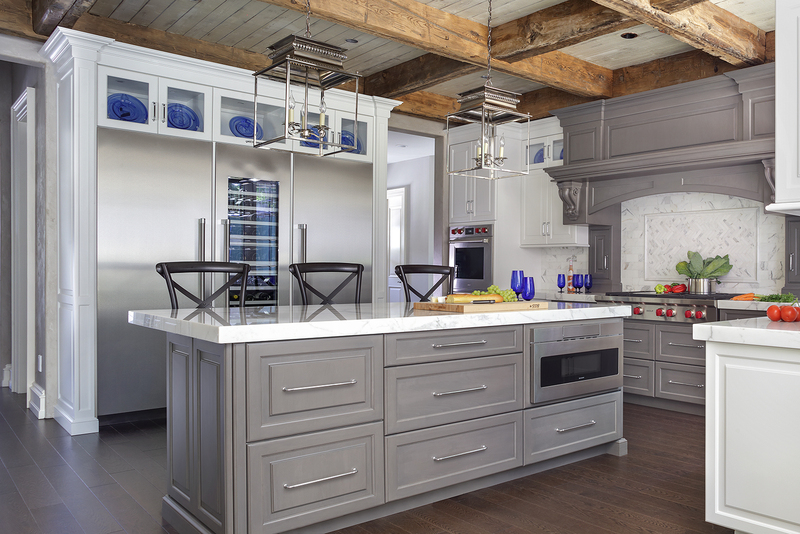 In this example, Peter Salerno and his team use a Provence blue La Cornue range (much like Pantone’s Niagara) as the central focus for a kitchen design and couples that with the light blue shade on the island base. 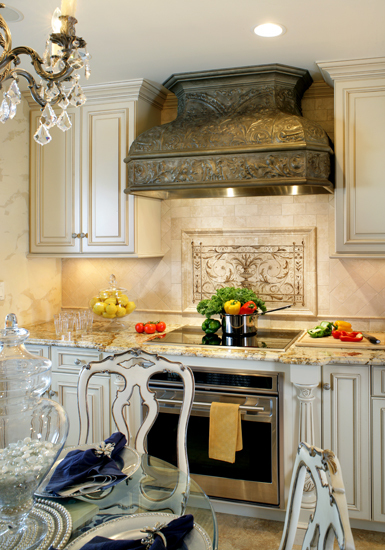 The design also uses pops of Hazelnut in the backsplash and fresh greens and vegetables to add yellows and reds to the aesthetic. Chelsey’s take on “luxurious surroundings” includes keeping the palette “light and airy”, a nod to the natural, outdoorsy feel of this season’s Pantone colors. Light blues and yellows, tidy neutrals and plenty of ambient light help create an air of class, distinction and elegance to your home design. 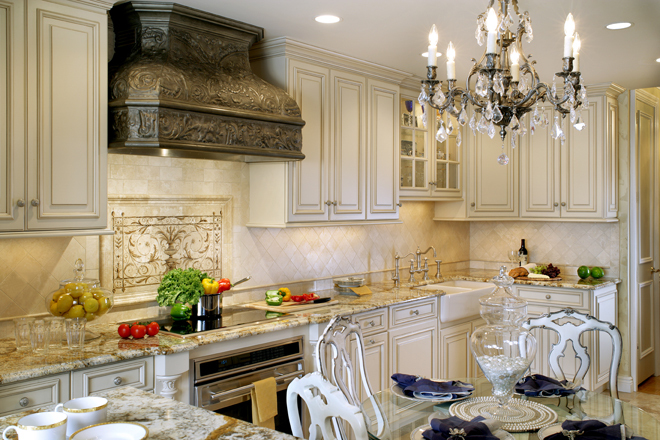 Peter Salerno Inc. award-winning custom kitchen design. 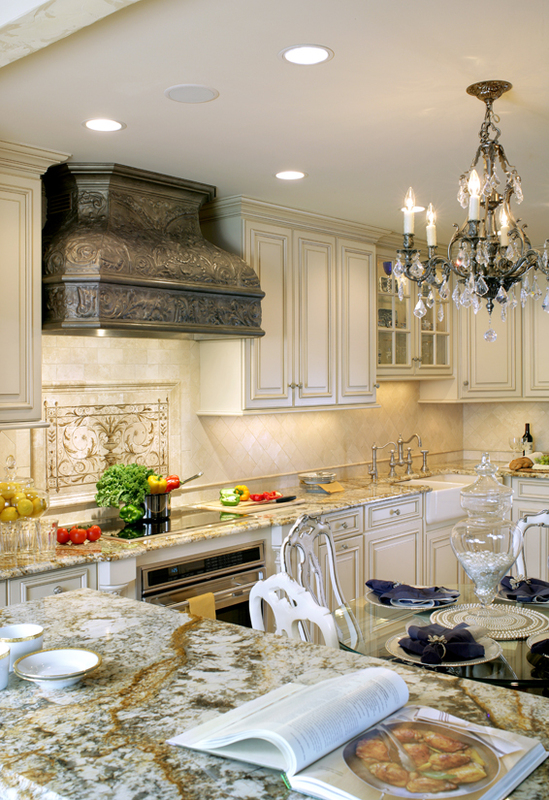 This kitchen design uses a touch of summery yellow wallpaper and recessed interior cabinet lighting (along with dimmed island lighting and a dining room chandelier) to create a warm, amber touch of elegance and class. The rest of the design is kept stately and distinct with bright, clean whites and warm neutral wood tones, and the open floor plan allows for plenty of ambient light. With all the eye-catching color adorning Spring 2017 designs, neutrals must play a role to keep balance. 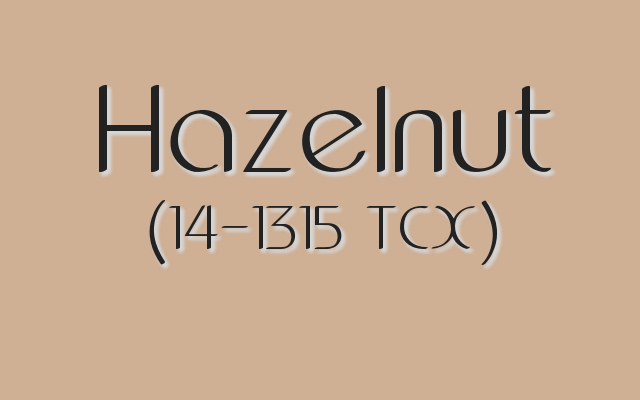 Unlike the past, however, “neutral” is no longer synonymous with “boring” or “old-fashioned”. Rather, the proper use of intriguing neutrals and brilliant whites can work wonders in a modern design setting. For example, this gorgeous transitional kitchen design manages to convey modernity while being almost entirely comprised of white and taupe/brown neutrals. The trick, as designer Peter Salerno Inc. explained to “Design Your Lifestyle”, is all in being creative while maintaining a natural flow. 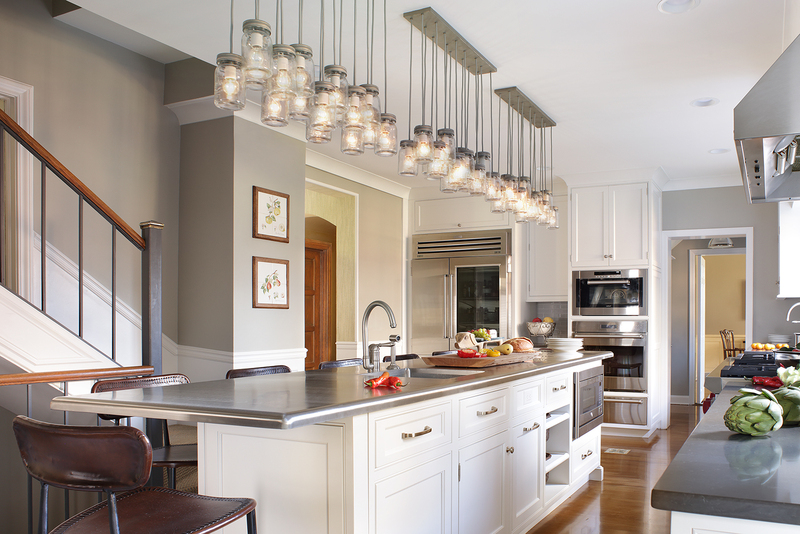 We adore the statement island lighting (Exter 16-jar pendants from Pottery Barn), and the slightly out-sized unique stainless steel island countertop (1 1/2″ Stainless Steel by EMI Industries in Boonton, NJ). Every so often, we read an article that’s such a home run we have no choice but to share it. HGTV’s Keri Sanders put together a huge winner recently on HGTV’s Design Blog – a perfect cross of fashion design and home design that is a must-read for designers (and design lovers) across multiple industries. Keri’s article, “The Hottest Spring Fashion Trends + How to Use Them in Your Home”, is a fantastic primer on how to combine Spring 2017’s hottest design trends in home and fashion. From textures to color blocking, metallics to bright citrus tones, Keri and the HGTV staff show you how to take the hottest spring looks off the runway and use them to reinvigorate your home design. HGTV is one of our go-to destinations when it comes to drawing inspiration from the world’s foremost custom home designers. It was such a cool treat to find Keri’s article, blending the runway with the living room and the fashion retailer with the home designer. 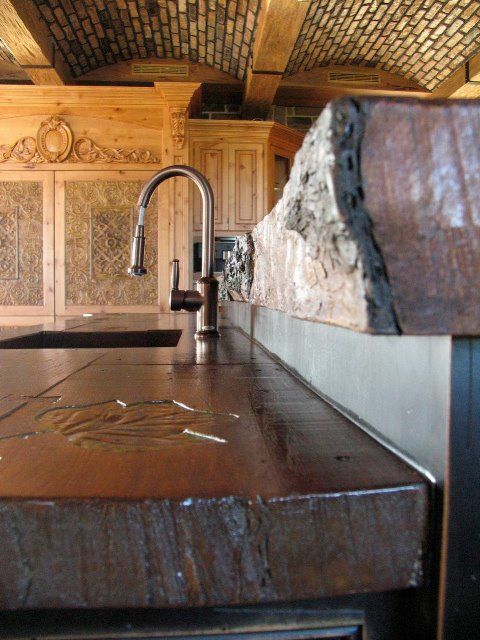 For the full article, head on over to HGTV’s Design Blog. But while you’re here, grab a sneak peek of some of Keri Sanders’ most inspired ways to utilize Spring 2017’s hottest fashion trends in your home design! Citrus tones were everywhere on Spring 2017 fashion design runways and exhibits. If you’re willing to be bold, those tones can make their way into a vibrant home design. From sunrooms to kitchens (and even open plan living spaces), bright citrus tones inject a dose of sunny optimism into your home design. 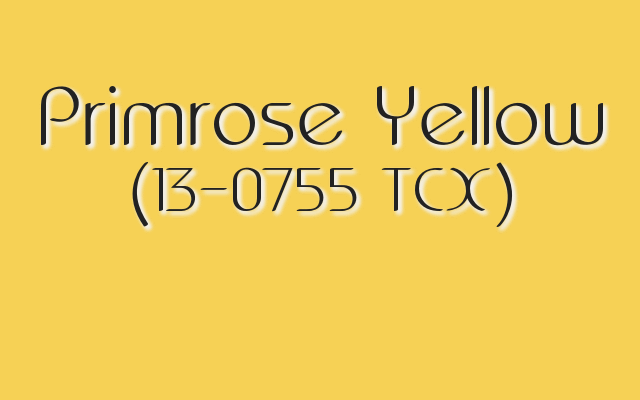 On the Spring 2017 Pantone color palette, 3 tones can qualify as “citrus” in our opinions: the jazzy orange Flame, the soft yellow Primrose Yellow, and the off-lime of Greenery (the 2017 Pantone Color of the Year). While Greenery is the easiest to use in an “all-over” context, don’t be afraid to experiment with dashes and splashes of Flame and Primrose Yellow in your home design accents, decor and accessories. “Wicker furniture, painted brick, grasscloth walls — this spring is all about creating interest and depth by incorporating texture within the home,” Keri Sanders explains. 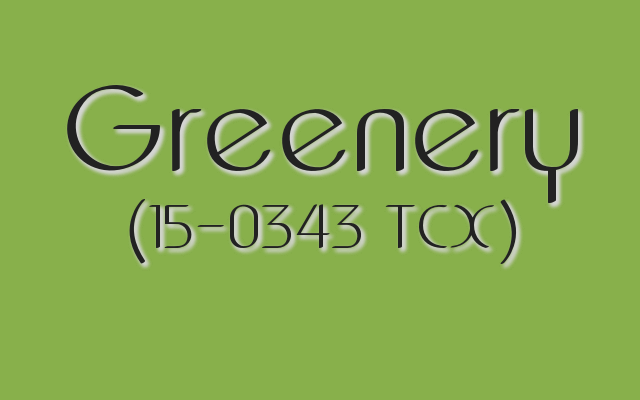 All of those trends work beautifully with the home design trend of “greening” your space. 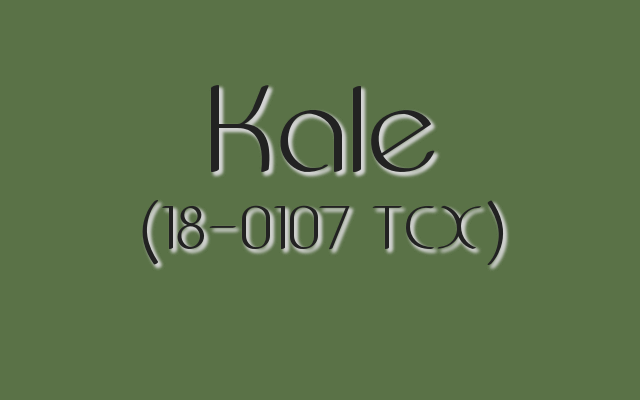 Brick, wicker and grasscloth enjoy great design synergy with fresh green plants, ferns, and Pantone Spring 2017 color selections like Greenery, Kale and Hazelnut. For a more “industrial” aesthetic to your home design, use textures like exposed stone, brick, textured subway tile, and faux stone made from concrete. Cork tile is also a unique way to introduce texture to your flooring. 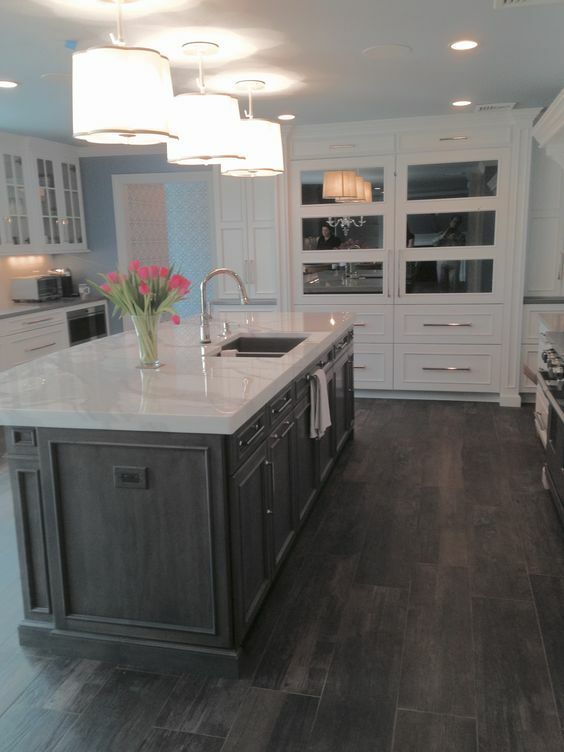 This up-close look at a Peter Salerno Inc. 2017 kitchen design shows the use of multiple textures.